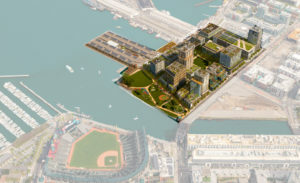 The San Francisco Giants’ proposed 28-acre development at Mission Rock earned unanimous support from the Board of Supervisors in February. EPS congratulates the Port of San Francisco and the Giants on this momentous achievement. approximately 1,500 new homes, 1.3 to 1.7 million square feet of office space, structured parking, retail shops, and restaurants. The project will fund sea level rise resiliency and adaptation features, promote the historic rehabilitation of Pier 48, and improve public waterfront access. The location of the project is the current site of the San Francisco Giant’s parking lot A.
EPS has worked extensively in recent years to advise the Port on financial aspects of this important project, including assisting with real estate feasibility and public financing issues. EPS will continue to support the Port in ongoing efforts related to project implementation.